The Base Project connects artisans in the developing world with the U.S. fashion market, helping those artists afford things like healthcare and education. 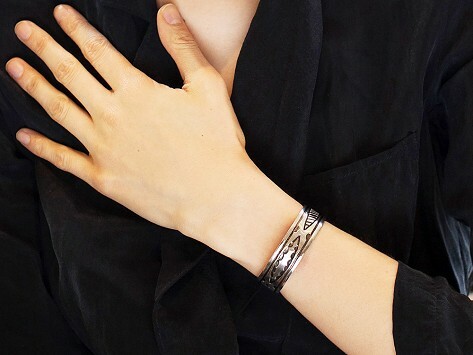 Their brass bracelets, made in NY, feature etchings of Namibian tribal designs. Interior engraving: "Designed by artisans in Namibia, Africa. Proceeds from your bracelet fund a child's education in each artisan's local community. Wear your impact." Dimensions: Small: 7.5" circumference x 0.6"; Medium: 8.5" circumference x 0.6"
Weight: Small: 0.056 lb. ; Medium: 0.075 lb. Bracelets from The Base Project have a distinctly African imprint. Hand carved by artisans in Namibia, the scenes showcase the local landscape in bold, abstract form. It’s that very region that twin brothers Chris and Doug Akin wanted to help when they founded The Base Project. They have empowered two Namibian tribes, who use traditional techniques to make these unisex accessories. The work provides an improved life, with access to healthcare and education. Fashioned from upcycled water pipes, the virtually unbreakable plastic bracelets resemble carved bone. Striking designs reflect the winding rivers, sand dunes, and even the wildlife that has surrounded the tribes for generations. The brass bracelets are etched with the same ethnic patterns, highlighted by a rubbed finish. The timeless scenes are more than a beautiful backdrop. Wearing them helps brighten the future of hard-working artists halfway around the world.